Since its release in 2001 the Sci-Fi fantasy Donnie Darko has become something of a cult classic. In a relatively low budget yet ultimately stylish fashion it covers twenty-eight action packed days in which the eponymous anti-superhero must save the world, or at least his particular microcosm. Jake Gyllenhaal gives a winning performance as the spaced-out Donnie whose insights into a parallel universe deepen when a jet engine falls through the space/time continuum into his bedroom. 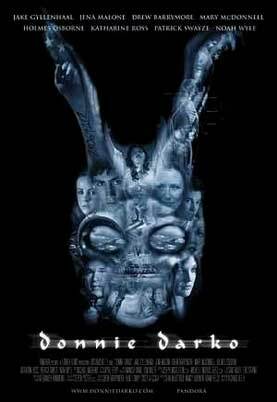 Guiding him through the mystery of what is happening around him is a freaky six foot bunny rabbit named Frank, an old lady nicknamed Grandma Death and Gretchen, a cute new girl in his class (Jena Malone). While these three appear to be on Donnie’s wavelength, visits to his therapist (Katherine Ross) reveal him to be a text book paranoid schizophrenic. So much for the real world. Writer/director Richard Kelly, an avid fan of Stephen King and Stephen Hawkings, takes us through his creative thought process on the DVD commentary which includes twenty deleted and extended scenes. Some of these would have added useful information but the movie holds up just fine without them thanks to a top notch cast including Mary McDonnell as Donnie’s mother and Drew Barrymore as his progressive English teacher. Beth Grant is also a scene stealer as Donnie’s uptight personal development coach who introduces into the curriculum the work of a local motivational self-help guru (Patrick Swayze) with some hilarious results. The film is set in 1988 and there are some memorable tunes in the soundtrack to emphasise the fact, including great cover versions of Tears for Fears’ ‘Mad World’ and The Church’s ‘Under the Milky Way’. For a warped out time travel movie this one is definitely worth your attention.